Professor Alexander Thom held the chair of Engineering Science in the University of Oxford from 1945 until his retirement in 1961. It was during a sailing trip in the western isles of Scotland that he first became aware of the potential of astronomical alignment, when he saw the Sun setting behind a standing stone to the west. 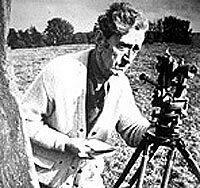 While it was known that the Sun rose behind the heel stone at Stonehenge, Thom's “Megalithic Sites in Britain,” and his subsequent “Megalithic Lunar Observatories,” and “Megalithic Remains in Britain and Brittany,” woke up archaeologists to the reality that astronomy must be considered every time a neolithic sacred site was excavated. I had the same difficulty as most archaeologists had with Thom's work. I didn't feel that I knew enough math to follow his work. It took me two years after purchasing his books to screw up the courage to read them! But it was worth the wait. Using the technique of reading until I didn't understand the math, and then skipping as little as possible and taking up the thread again, I found that there was no doubt about it, Thom had shown that our neolithic foremothers and fathers ‘gnew’ about astronomy.